No special protection! Just a mask and quick reflexes. Brain didn't get a chance to really get his hooks in and start influencing his behaviour. Side note: this scene, along with the later attack on Mr. Rexford, were intended as early clues to Brain's real abilities. With Mr. Blank, we saw a failed attempt at a full wipe... or as Hazel calls it, the "full treatment". With Mr. Rexford, we see the successful erasure of a single memory... although readers didn't know that was what they were seeing at the time! Gert doesn't have any designs on the Ninja Mafia anymore. She doesn't even want to be involved. She has her own life to take care of. She's strictly there helping prep the cadets as a favour to Sam. And now, it would appear Sam has overstepped the bounds of that favour and ticked her off. We'll find out what means in future comics! Oh shoot, out of time! That's a wrap for this week, team. See you on Monday! Speed lines! They are like tunnel lines, only straighter. We return on Friday with our next comic and our latest round of Q and A. If you've got a burning question you want answered, just launch it my way in an email with "Q and A" in the subject line! 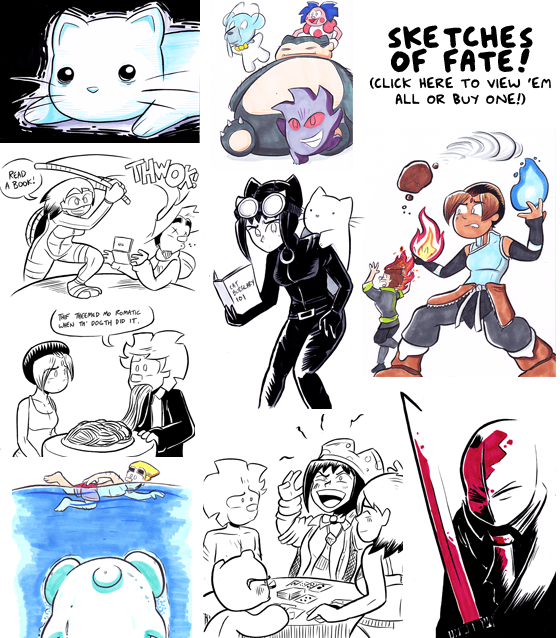 Thanks to everyone who tuned into the Commission of Fate sketch-off on Friday! I had a lot of fun chatting with you all while I drew stuff. Let's do it again sometime! If you'd like to nab one, just drop me a line!